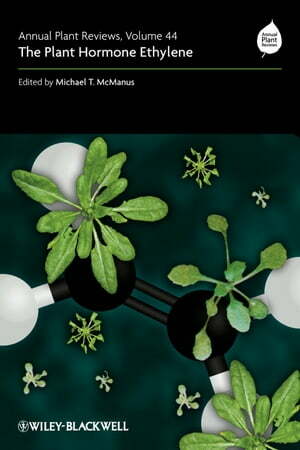 Collins Booksellers - Annual Plant Reviews, The Plant Hormone Ethylene by Michael T. McManus, 9781118223116. Buy this book online. The plant hormone ethylene is one of the most important, being one of the first chemicals to be determined as a naturally-occurring growth regulator and influencer of plant development. It was also the first hormone for which significant evidence was found for the presence of receptors. This important new volume in Annual Plant Reviews is broadly divided into three parts. The first part covers the biosynthesis of ethylene and includes chapters on S-adenosylmethionine and the formation and fate of ACC in plant cells. The second part of the volume covers ethylene signaling, including the perception of ethylene by plant cells, CTR proteins, MAP kinases and EIN2 / EIN3. The final part covers the control by ethylene of cell function and development, including seed development, germination, plant growth, cell separation, fruit ripening, senescent processes, and plant-pathogen interactions. The Plant Hormone Ethylene is an extremely valuable addition to Wiley-Blackwell's Annual Plant Reviews. With contributions from many of the world's leading researchers in ethylene, and edited by Professor Michael McManus of Massey University, this volume will be of great use and interest to a wide range of plant scientists, biochemists and chemists. All universities and research establishments where plant sciences, biochemistry, chemistry, life sciences and agriculture are studied and taught should have access to this important volume.